Today is the anniversary of the death of Prince. The music legend died at the age of 57 after a self-administered dose of opioid fentanyl, according to Midwest Medical Examiner’s Office in Minnesota. Prince's tragic death highlights a growing problem in this country involving fentaynl — aka "The Kill Pill" — that is claiming an increasing number of lives each day. And on the anniversary of Prince's death, I can't help but think: If we learn anything about Prince's death, it's that it's time to take action by becoming spreading awareness of this grave issue and protecting our loved ones from becoming another victim. The drug, fentanyl, comes in many forms, but right now, even drug investigators have difficulty telling the difference from one drug form from another. In Prince's case, deadly traces of fentanyl were found in hydrocodone pills in his Minnesota home. Although it's not known if the same drugs in his home were the ones that claimed his life, the superstar's death shed light on how the drug gets into the hands of unsuspecting victims who look for pain pills on the street. It only takes the equivalent of 3 grains of sand in the form of fentanyl to kill someone. Fentanyl comes in various forms: patches, pills, or via injection. Illegal drug manufacturers often mix small portions of fentanyl into other substances and then sell them on the street. Fusion Television covered the drug crisis in a show called, Death by Fentanyl, Part 1: The ‘Serial Killer’ of Drugs, which revealed that the epidemic is sweeping the nation affecting both wealthy families and the homeless. The series revealed that the drug is making it across the border from Mexico and into the United States. However, that's not the only way it gets into the wrong hands. Some blame drug companies for creating prescription drugs that are highly addictive. Others place blame on states, like Florida — with its alleged poor oversight that allows pain pill mills to form or and regulations that prevent patients from getting doctor prescribed pills from their local pharmacy — that creates the opportunity to transport synthetic pills to other parts of the country. 1. In Maryland, the death toll from opioid drugs is so great, that the Medical Examiner's Office released a statement recently that they are "overwhelmed" and in a crisis situation. 3. Kentucky ranks #1 for drug overdose deaths and is struggling to process the bodies affecting their offices and has declared their situation an epidemic. 4. In Massachusettes, the number of deaths at the beginning of 2017 were more than double from 2016. In fact, two-thirds of the deaths caused by drug overdose in the state involved the drug, opioid fentanyl. And, the number of drug-related fatalities across the nation, and predominately caused by fentanyl, continues to grow. Here's how the National Institute on Drug Abuse defines this deadly drug: "Fentanyl is a powerful synthetic opioid analgesic that is similar to morphine but is 50 to 100 times more potent." The schedule II prescription drug is prescribed to patients who are under treatment for pain management, and not until long after starting treatment, a tolerance makes it difficult for them to experience relief. The NIDA reported that in 2015, a little over 50,000 deaths were associated with all prescription drugs, a jump of almost 30,000 from since 2002. 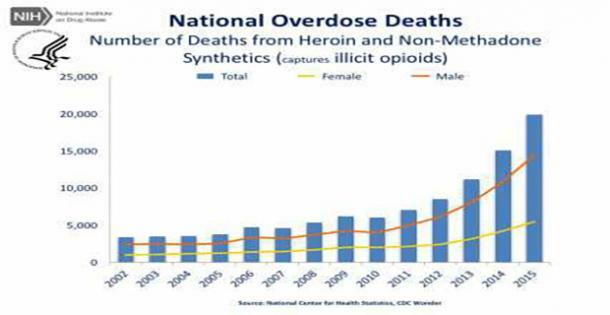 More than half of those deaths were connected to opioids and dominated by fentanyl, and according to NIDA, "From 2002 to 2015 there was a 5.9-fold increase in the total number of deaths." It's tragic when celebrities we love, become an overdose victim, but their fame can bring an increased awareness to a nationwide problem. If you, or someone you love has become addicted to fentanyl, there's still time to get help before it's too late. You can contact SAMHSA’s National Helpline is a free, confidential, 24/7, 365-day-a-year treatment referral and information service (in English and Spanish) for individuals and families facing mental and/or substance use disorders.